It’s rare to test a bike that’s truly different. 3T’s Strada is one of those rarities. Sure, it looks distinctive, but many bikes have a distinct look that’s not necessarily mated to a truly different ride. The Strada is a unique beast not only because of its 1X drivetrain, but also for its approach to aerodynamics. Aside from the lack of a front derailleur, the most significant visual cue is the curved seat tube. That curve serves two purposes: First, it hides the rear wheel tightly within the frame to reduce drag; and second, it aims to match the natural airflow as it hits that area of the frame. 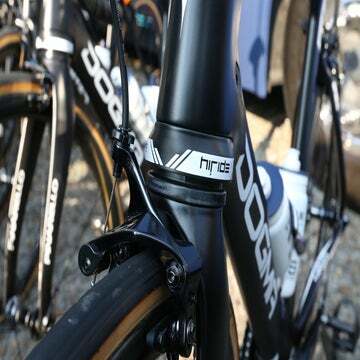 That latter point can be said about the fork crown and even the down tube shape. The fork, too, has a unique shape that 3T says is designed to reduce drag at typical riding speeds. The Strada has clearance for 28-millimeter tires, but beyond that, the clearance is extremely tight both in the front and rear of the bike. That’s another nod to aerodynamic gains. As you might imagine, a bike with this many aerodynamically shaped tubes delivers a stiff ride. And the Strada relies almost entirely on the size of the tires to deliver compliance. The seat stays are also fairly thin for some additional flex. While the Strada is by no means an uncomfortable ride, you won’t mistake it for an endurance bike. Consider this a race tool tailored to pedaling response. We were happy for that stiffness when it came to sprinting and powering up climbs. Did the sum of all that aero design make us any faster? Like any company’s aero claims, they are impossible to verify without sending the bike to an independent wind tunnel for testing, which we were unable to do. We can, however, say with some certainty that 3T has done an impressive job of reducing the frontal area of the bike — which should, in theory, reduce drag. The Strada sports a long, 60-millimeter trail combined with a 73-degree head tube angle. That’s all pretty standard fare for an aero bike, yet the Strada handles more lithely than most bikes in the category. Perhaps that’s because of the short stack (536 millimeters) and reach (381 millimeters) that puts the rider in a very aggressive, low and forward position. The front-center measurement is short too, at 573 millimeters. By combining the stability of a long trail figure with the aggressive, forward geometry of the stack and reach, 3T hits a well-balanced position that creates lively but stable handling. About that 1X drivetrain. There’s certainly a lot to love — simplicity, a clean aesthetic, the opportunity for weight savings, and one fewer thing to worry about when you want to dump gears. SRAM’s Force X1 group has become a staple on cyclocross courses for very good reason: it works. The only thing that holds the system back are the large jumps between cogs. 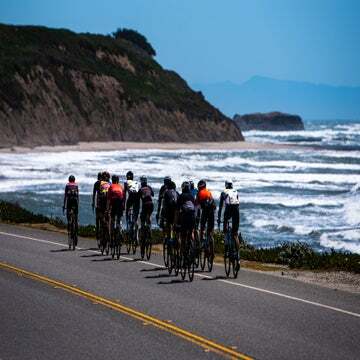 It’s easy to find yourself lost between gears — shifting to a higher gear will have you pushing harder than perhaps you should, while shifting to a lower gear sends you into a grinding cadence. It is those significant jumps between gears that could make you yearn for your trusty 2X drivetrain. Fortunately, 3T has developed its own cassettes meant for use specifically with this bike. The Overdrive cassette has tightly spaced cogs in the middle gears and a big jump at the high end. The Bailout cassette takes things in the opposite direction: it has the same tightly spaced middle cogs with a big jump to your easiest gear. The cassettes have the potential to improve the usability of 1X for most applications on the road. With so much focus placed on aero performance and light weight, the Strada feels like a natural step in the race bike’s progression. There are several nitpicks — the cable routing around the stem could be sleeker, for example — but with so many distinct advantages, it’s possible we’re witnessing the future of race-bike DNA in the Strada.